Days lengthen, flowers blossom and temperatures start to rise. 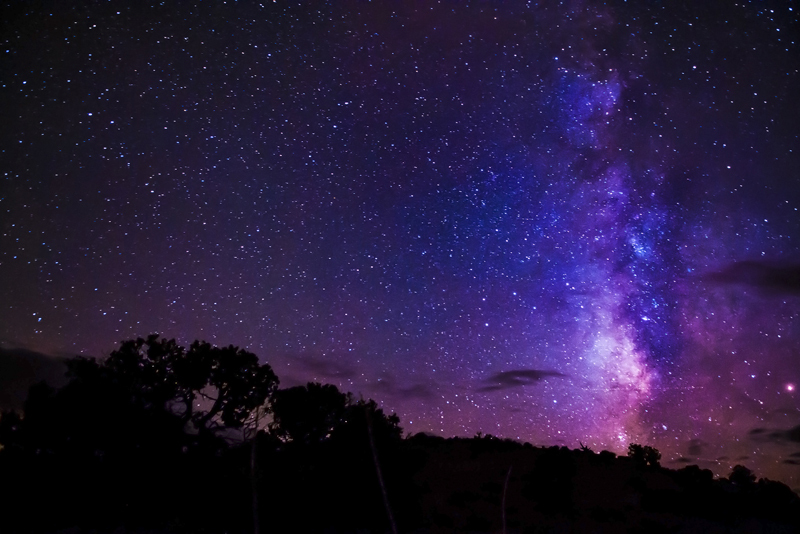 It's spring - and one of the perennial heralds of spring can be found in the night sky. It's a star called Arcturus, actually the brightest star in the entire northern half of the sky. 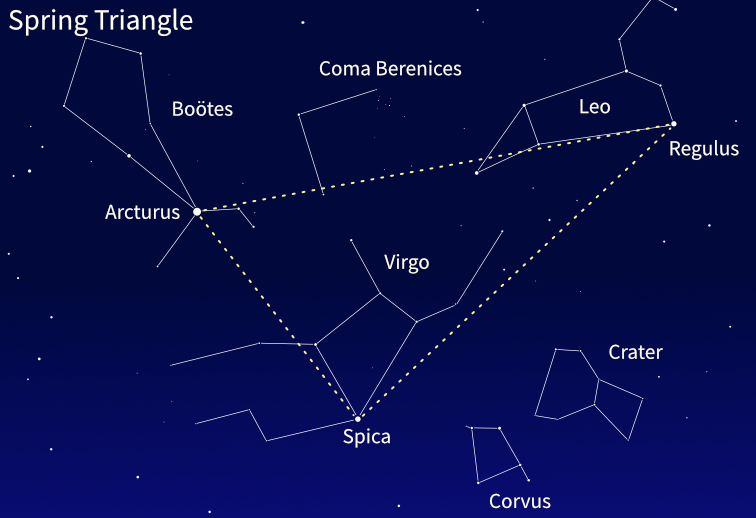 You can easily find Arcturus using the familiar saucepan-shape of stars known as the Big Dipper (the Plough). Follow the dipper's curving handle and you will come to Arcturus. It's a larger and cooler star than the Sun, and fittingly enough appears much the same golden yellow color as a spring daffodil. When Arcturus reappears in the evening sky, you can be sure that spring has returned. Arcturus lies in the constellation Bootes, the herdsman. At this time of year the seven stars of the Big Dipper lie virtually overhead in the evening sky for those in mid-northern latitudes. Look carefully at the star in the bend of the handle, called Mizar. If you have good eyesight you should be able to spot a fainter star next to it. This companion is called Alcor. If your eyes aren't sharp enough, turn a simple pair of binoculars on Mizar and you will easily see Alcor. All star-spotters know that the two stars in the bowl of the Big Dipper farthest from the handle point to the north pole star, Polaris. But follow these pointers in the opposite direction, away from Polaris, and you will come to Leo, the lion, the most regal member of the spring skies. Unlike many constellations, Leo really does look like the animal it represents, in this case a crouching lion. Leo's most obvious feature is a sickle-shape formed by six stars, like a question mark in reverse, representing his head and chest. At the foot of the sickle is Leo's brightest star, Regulus, marking the lion's heart. Between Leo and the winter constellation Gemini scuttles the faint constellation Cancer, the crab. At its heart lies a swarm of stars popularly known as the Beehive or the Manger. This star cluster was known to the ancient Greeks, who could see it as a misty spot with the naked eye in the dark Mediterranean skies. Through binoculars it does indeed resemble a swarm of bees around a hive, but if you prefer to visualize it as a manger there are two stars - one to the north and one to the south of it - which in legend represented donkeys feeding from it. The seven stars of the Big Dipper (eight if you include Alcor) are part of the constellation Ursa Major, the great bear. The area in and around Ursa Major harbors some of the most beautiful and best-known galaxies in the sky. 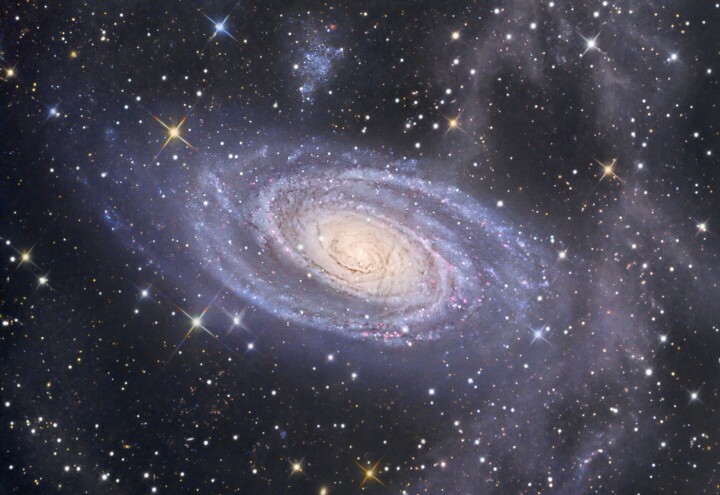 One of my favorites is M81, a beautiful spiral in the northern reaches of Ursa Major, often pictured in books. Click to see a picture of M81 taken by Tony Hallas. 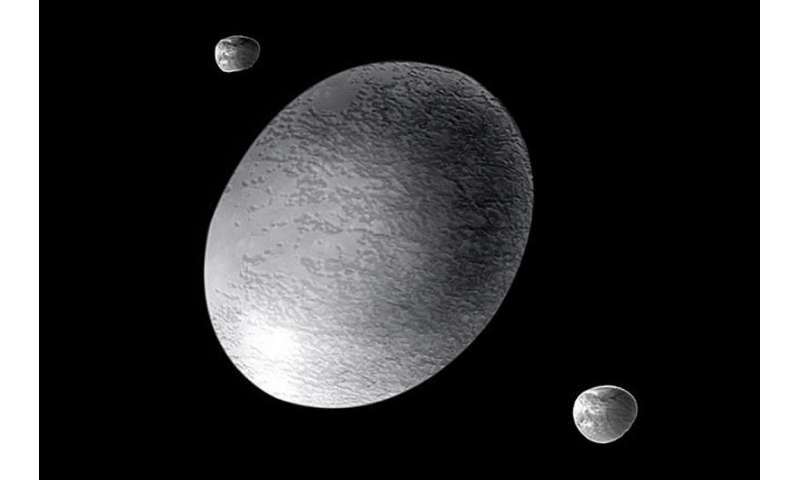 It is bright enough to be found in binoculars under clear dark skies, appearing as a hazy glow about one-third the apparent diameter of the Moon. Unfortunately, you won't see the lovely spiral arms, as this needs a large telescope. M81 is a coiled mass of stars similar to our own Milky Way Galaxy, but lying some 12 million light years away. North of the end of the Big Dipper's handle is another well-known spiral galaxy, M101. It's twice as far from us as M81 and we see it virtually face-on. Long-exposure photographs taken with large telescopes show that its arms are noticeably more loosely wound than those of M81. 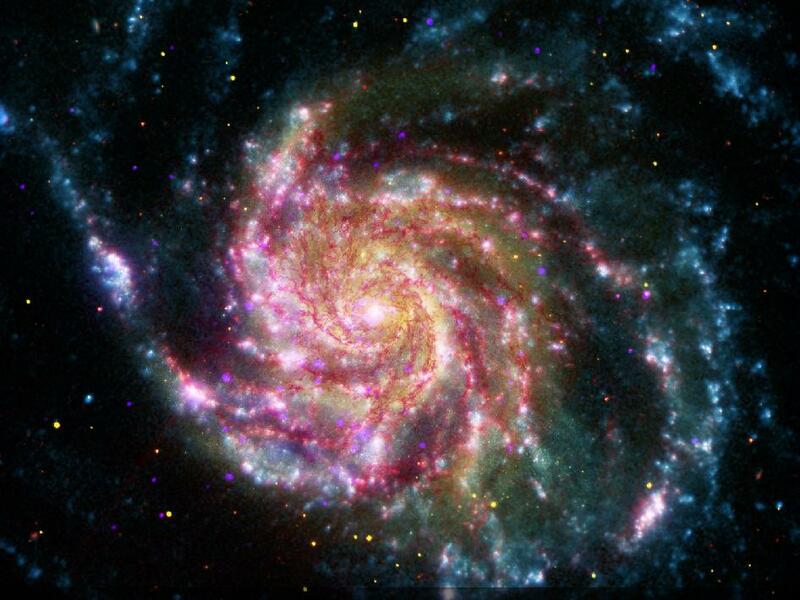 This picture of M101 is a composite of images taken at different wavelengths. South of the dipper's handle lies a galaxy that played a crucial role in our understanding of the Universe. It's called the Whirlpool, and was in fact the first nebulous object in which spiral shape was discerned. The discovery was made in 1845 by an Irish astronomer called Lord Rosse. He had built what was then the world's largest telescope, with a mirror 72 inches across, at his castle at Birr in Ireland. Prior to Rosse's discovery it was thought that all nebulous objects were either clouds of gas or clusters of faint stars in our Galaxy. The discovery of the Whirlpool's spiral shape was the first step to establishing that some of them are actually galaxies way beyond our own Milky Way. The Whirlpool is now estimated to lie about 25 million light years away and is a magnificent object. This photograph of M51 by Martin Pugh earned him the title of Astronomy Photographer of the Year 2012. Finally, let's return to the curving handle of the Big Dipper. Follow the curve of the handle beyond Arcturus and you will come to another prominent star, called Spica, which is the brightest star in the constellation Virgo, the virgin. Virgo contains another famous galaxy, popularly known as the Sombrero. This is a spiral seen almost edge-on and looks rather like a Mexican hat, hence its popular name.